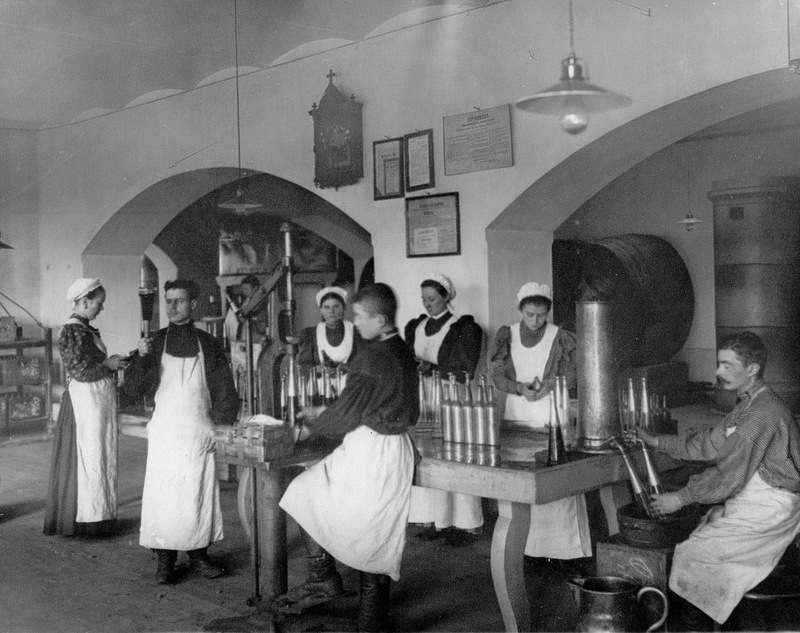 According to legend, the first recipe of vodka was created around 1430 by Isidore, a monk living inside the Chudov Monastery in the Moscow Kremlin. The drink was made through the distillation of fermented cereal grains and was not as strong as today’s version – it never exceeded 40 percent ABV. 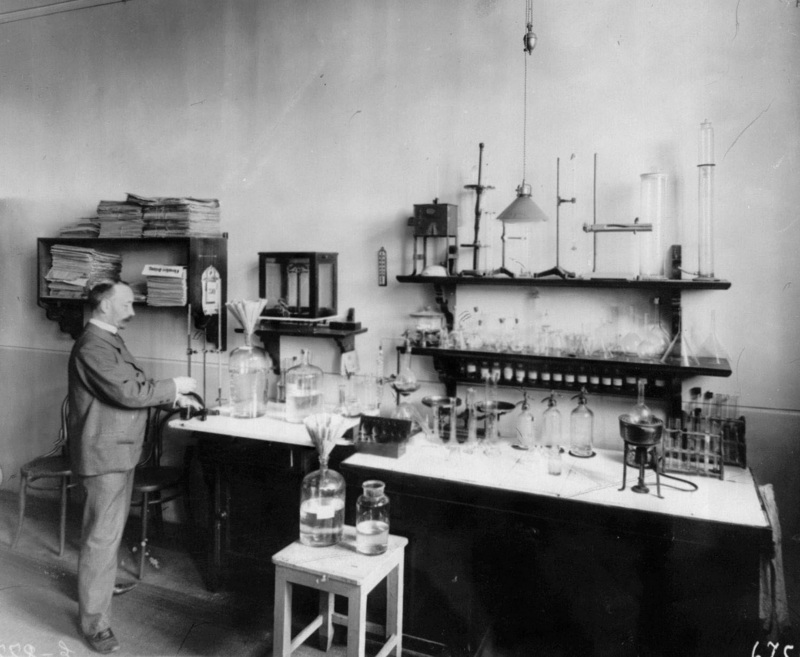 // A laboratory. 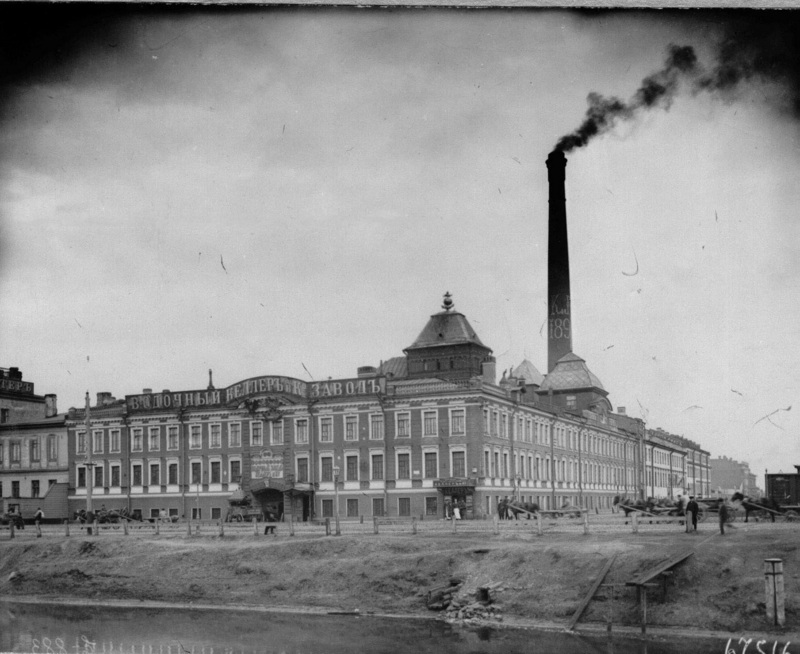 Join us on a tour of Russian vodka history from its inception through mass production under the tsars. Welcome to the vodka factory of the company Keller & K°, founded by a Russian citizen with German roots. It opened in 1863 at the corner at what is today the Obvodny Canal Embankment and Zaozernaya Street in St. Petersburg. It opened the same year – 1863 – that the state monopoly introduced by Empress Elizabeth in 1751 was laid to rest. While the monopoly and promotion of state-manufactured vodka had made the drink popular, commercial liberalization caused the prices to drop significantly, allowing even low-income citizens to purchase it. 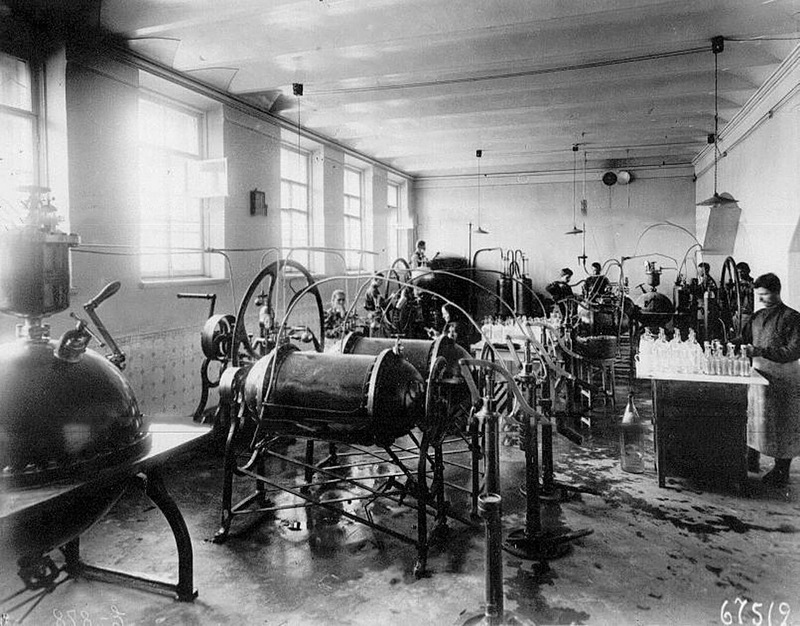 // Facilities for the distillation process at Keller & K°. 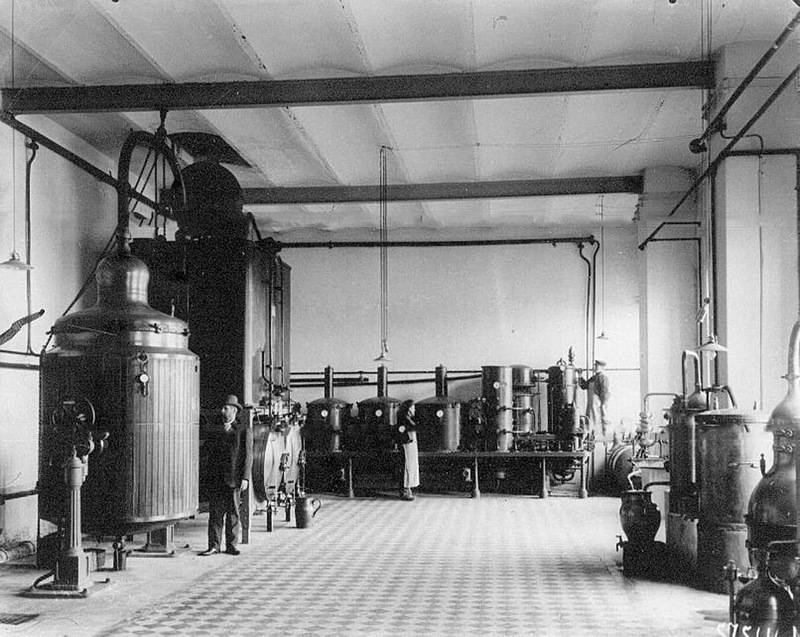 Keller and K° was chosen to represent the Russian alcohol industry at the universal exposition in Paris just four years after beginning operations. 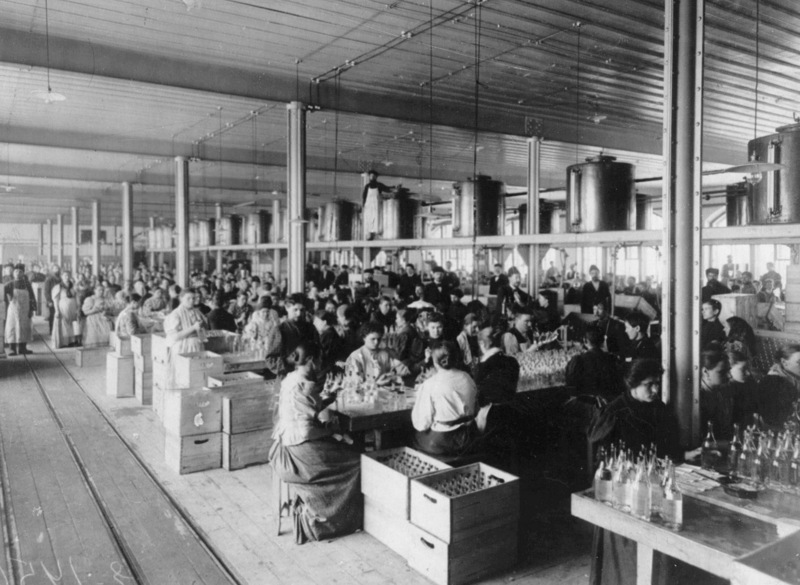 Its early products included grain alcohol, mint, anise, orange, English bitter vodka, tinctures, Doppel-kümmel, absinthe and “imperial liqueurs.” // Workers bottling vodka. 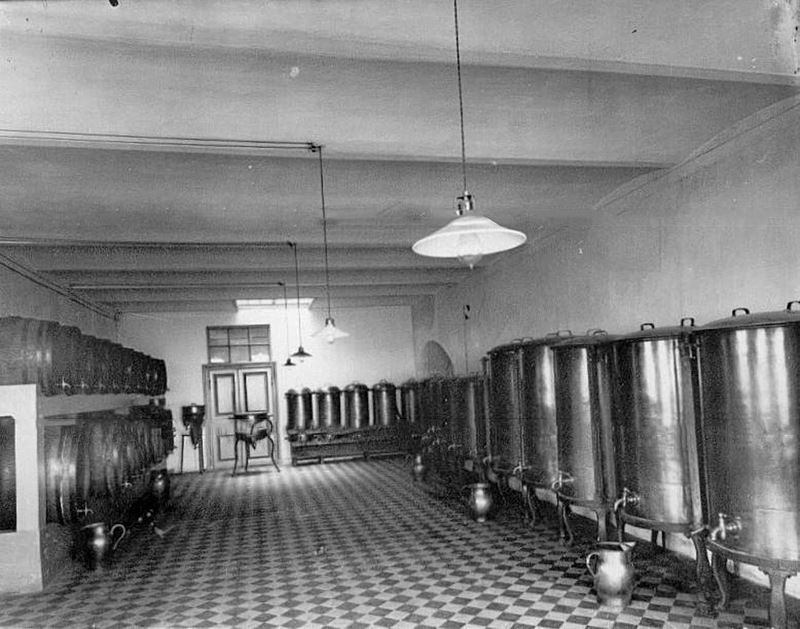 This is the room where fruit vodkas were bottled at Keller and K°. In 1911 Keller and K° was awarded the Gran-Prix at the universal exposition in Turin. After winning many competitions this was to be the company’s last major prize. Ironically this award preceded prohibition laws introduced in Russia at the beginning of World War I. // A wine cellar. The word “vodka” that is used to define today’s popular drink was not registered until 1751, when the state monopoly began operations. “Vodka,” is a diminutive version of the Slavic word “voda,” or “water.” The word was originally used to describe medical tinctures containing up to 75 percent alcohol. 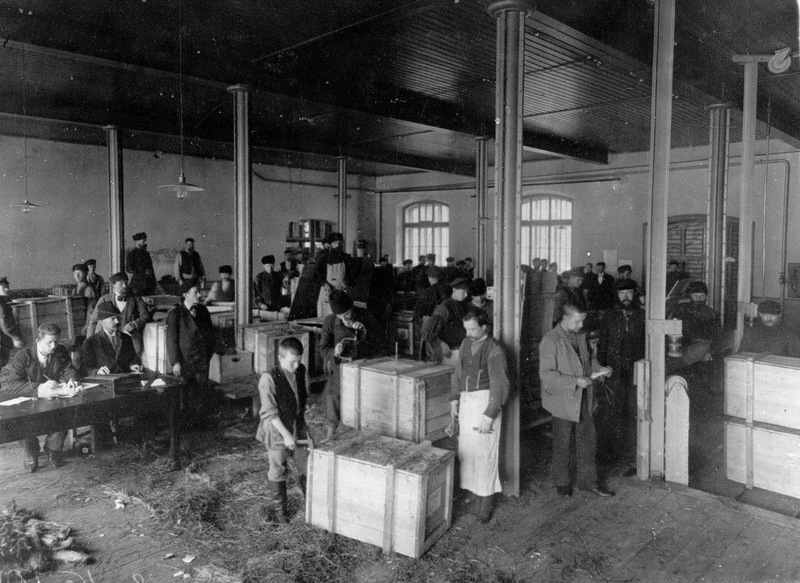 // The workshop for the preparation of packages at State Wine Warehouse No. 1 at Kalashnikov Embankment. 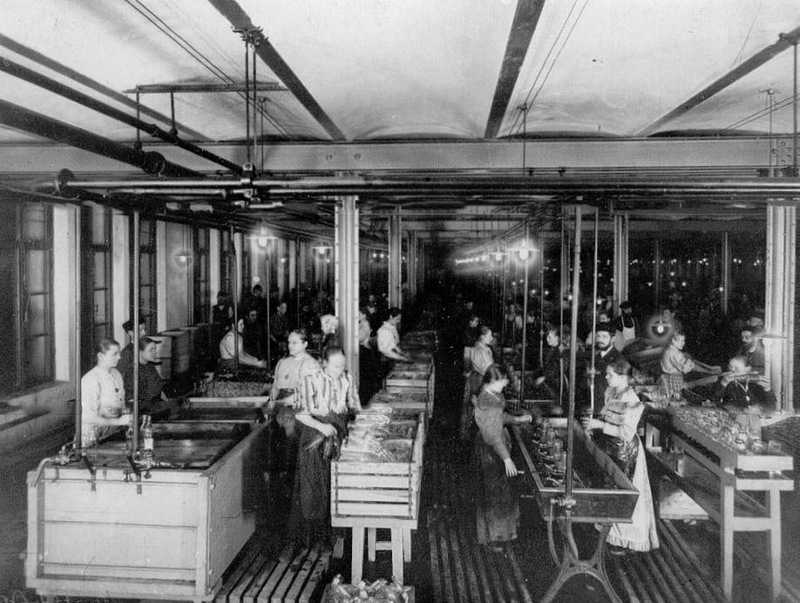 By 1892 Keller and K° had five shops in the capital alone and its products were sold also abroad. 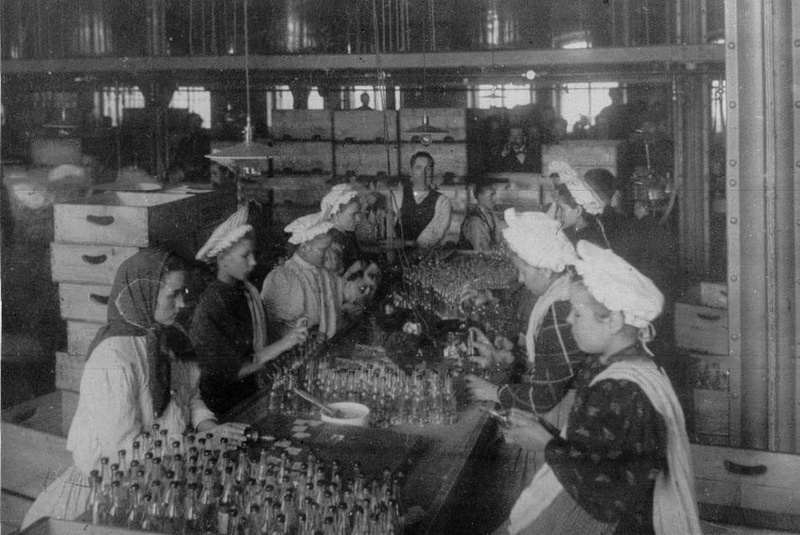 // Women labelling bottles before delivering them to the market. Did you know that during the Russian Empire the government used to make up to 40 percent of its revenue by taxing alcohol? This is the accounting office at State Wine Warehouse No. 1. 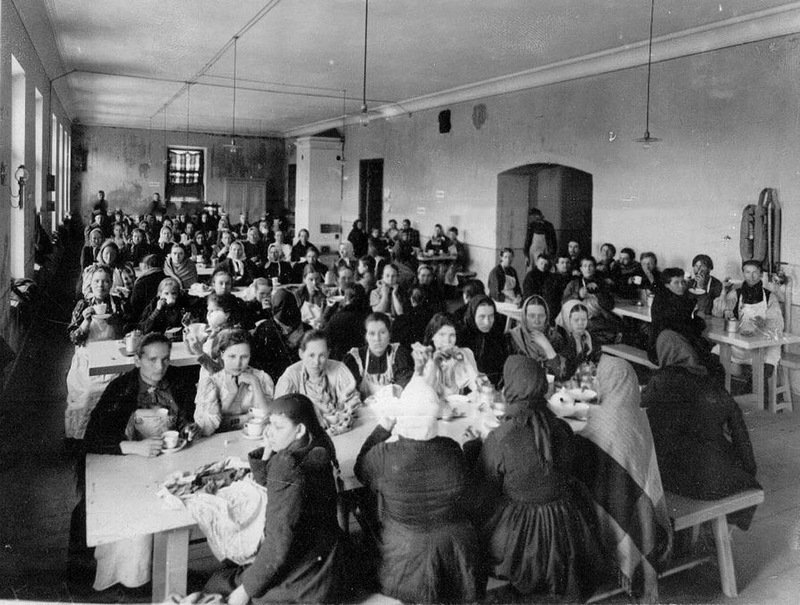 Workers waiting for lunch at the dining hall at State Wine Warehouse No. 1. 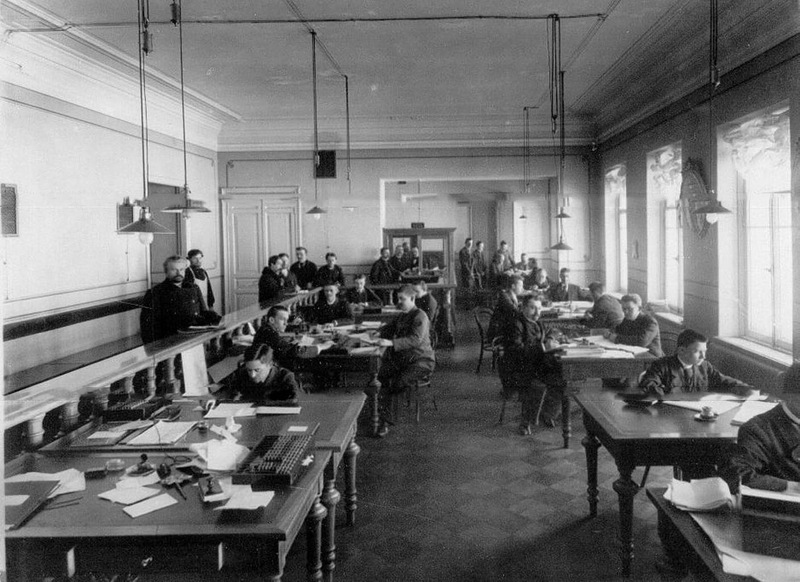 Keller and K° employed about 380 people at its peak. These women are in charge of sanitary procedures at State Wine Warehouse No. 2. Nowadays vodka constitutes about 70 percent of all alcohol consumed in Russia. // Workers packaging the final product at State Wine Warehouse No. 4.